It’s a Sunday night at Casa Marianella, nurse a shelter for recently arrived immigrants and asylum seekers in East Austin. As I carry my paper plate heaped with chicken mole and injera (an East African spongy flatbread), the sounds of a cumbia beat move the dancers out in the front yard. It’s a beautiful sight. Refugees and immigrants from Eritrea to Honduras serve a meal and share a dance. As their guest, I feel at once the kinship generous hospitality fosters. In Texas, the art of hospitality has been a staple of Southern lore and identity for as long as there have been porch swings and songs around the campfire. Yet the virtue of hospitality runs deeper than a Martha Stewart styled tray of tea sandwiches and wider than a heaping bowl of meaty chili. The true soul of Texas hospitality includes plates of mole and flatbread at a quinceañera reception, or a mejool date with a sip of water at an Iftar dinner, or a bit of bread and wine shared at Holy Eucharist. For people of many different faiths, hospitality is about who we are at our core, not simply about the interplay of guest and host. As a Christian, I am often struck by the experience of following a God who is both a gracious host and a humble guest. In our holy scriptures, story after story describes Jesus being invited into people’s homes as a guest, and then out in the wilderness feeding the hungry masses as host. He shows us what loving God and loving your neighbor looks like, and it looks an awful lot like cultivating time and space to share what you have with others. At its core, hospitality is about opening one’s self up to recognize and share in our common humanity. As Supreme Court Justice Thurgood Marshall wrote, “In recognizing the humanity of our fellow beings, we pay ourselves the highest tribute.” When we see in others a bit of ourselves, we step closer and closer to healing the divisiveness of our current age that would rob strangers, outsiders and “those people” of our common human dignity. We begin to see in them the image of God. This posture of recognizing our connectedness opens us up to become generous toward the outsider and the stranger, rather than giving in to a toxic blend of fear and suspicion. Of course, opening yourself to encounter the other is both risky and beautiful. When we encounter the stranger, the other, we will be changed by the encounter. That’s the risk. But how we are changed depends largely on the how we perceive difference. “Hospitality requires that a community be capable of receiving difference as gift.” So often difference is seen as threatening, dangerous and foreign rather than enriching, harmonious or complementary. If we open ourselves to truly meet and encounter the other, we can deepen our appreciation of the other, we can grow in empathy, and we can increase our capacity for love. Practicing hospitality orients us toward the common good and strengthens our communities. So how did you practice hospitality this Fourth of July? How did you open yourself up to receive difference as a gift around the barbecue pit, or at the fireworks display? Who did you invite to the neighborhood shindig, and how could an attitude of hospitality help heal our toxic national political discourse? Consider cultivating hospitality in your own spiritual practice. Opportunities abound for interfaith encounters with hospitality. Interfaith Hospitality Network turns places of worship into warm and welcoming shelters for the homeless. Interfaith Action of Central Texas’ Red Bench conversations bring people around the table to have conversations to improve interfaith understanding and civil discourse. 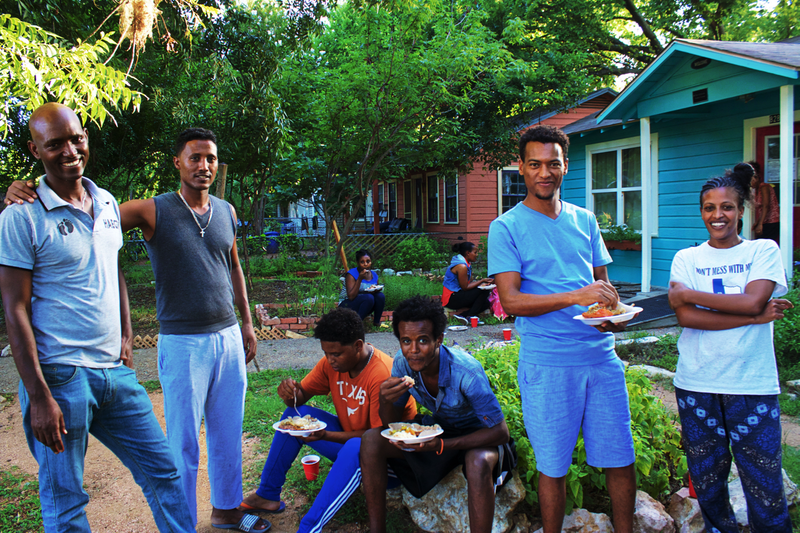 Refugee Services of Texas needs Welcome Teams to help provide hospitality to and support newly arrived refugees here in Austin. Casa Marianella could use your skills and talents to help the vulnerable, newly arrived immigrants and refugees become a part of the community. Find the ways your faith community engages in hospitality and be willing to receive the hospitality of others. It’s fine and good to talk about hospitality, but as a virtue it really comes alive in the doing. It’s in the eating, in the dancing, in the talking that we become hospitable, generous and peace loving people. The Rev. Madeline Shelton Hawley serves as a priest at St. James’ Episcopal Church in East Austin.